"'Now I know that no one can build his security upon the nobleness of another person.'" 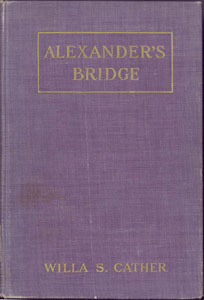 Published by Houghton Mifflin Co. on April 20, 1912. Published by J. Miles & Co. for William Heinemann in August 1912. Published by Houghton Mifflin Co. in 1922 with new Preface written by Cather. Published in New York Sun on May 25, 1912 and collected by L. Brent Bohlke in Willa Cather in Person: Interviews, Speeches, and Letters.